Typically when building websites that target local markets most publishers, use population and income data to decide which areas to focus on. Getting access to this data is often very cumbersome and time consuming and will often miss important markets you might not have considered. For the sake of this article let’s assume we’re building a new website, that will target the “day spa” market, and instead of just one city or state we’ll be trying to provide information across the entire United States. In the past publishers had to rely on census data and would target the most populous metropolitan areas like New York, Chicago, Los Angeles. You can get all of this information from the US Census bureau however, I prefer City-Data.com . The underlying data is the same it’s just much easier to navigate and extract the information. For example finding out which zip codes have the highest adjusted gross income is nearly impossible on government website, but it’s really easy on City-Data.com. You can also drill down and get a tremendous amount of data for a particular zip code like 90210 Beverly Hills. Using population and income data is good and should never be overlooked, however you will encounter a lot of competition in those markets, and you’ll never discover any untapped regions or diamonds in the rough. Using Google insights for [day spa US] yeilds some interesting results for our day spa keyword, the number one result is Alaska, followed by Maryland, Washington DC, and Utah. Drilling down into Alaska we can see the search volume matches the population down in the lower part of the state. Going to the city level we can see the searches are focused from Elmendorf Air Force Base. Let’s go back to the country level and break it down by metro, the top five areas are Victoria Texas, Anchorage Alaska, Baltimore Maryland, Savannah Georgia, and Greensboro North Carolina. I don’t know about you but I wouldn’t have picked those metro regions to start with. Let’s pick a bigger city to look at since there’s more data. 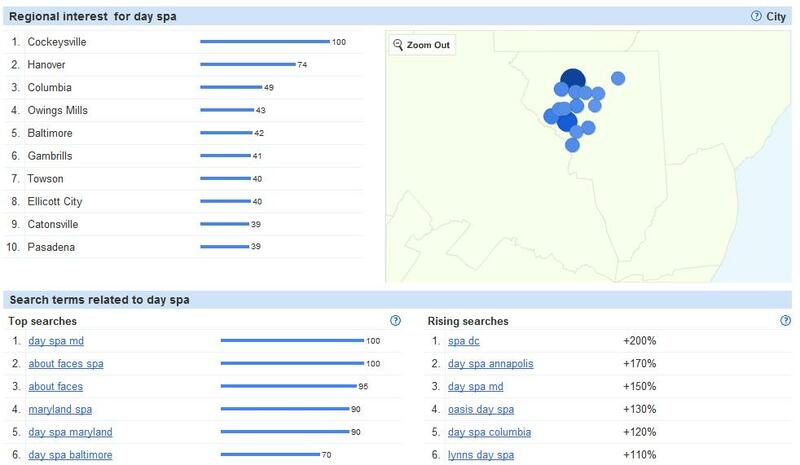 Here’s a look at [Baltimore Day Spa Searches]. Another aspect of the day spa market is gift certificates. While they can be bought locally, they can also be purchased through websites like SpaFinder.com and can be used at thousands of locations across the country. Looking up [day spa gift certificates] we can see there are two concentrations New York and California, not surprising at all. However when we step down to the metro level we can see there are several other spots as well scattered around the country. If you’re doing any local keyword research you should continue to use population and income level data to help you determine your primary geographic regions to focus on. However look to google insights to make sure you aren’t missing any key markets and to build your list of secondary metropolitan areas to target as well. Good article. I have used google for KW research and you gave me some new things to think about. Thanks.